Men’s soccer coach Schellas Hyndman wanted one thing for youth attending Saturday’s Future for KIDS soccer camp: To have fun. But he also encouraged them to exhibit good sportsmanship, practice, work hard and to value their education, much like the soccer players who conducted the camp do. 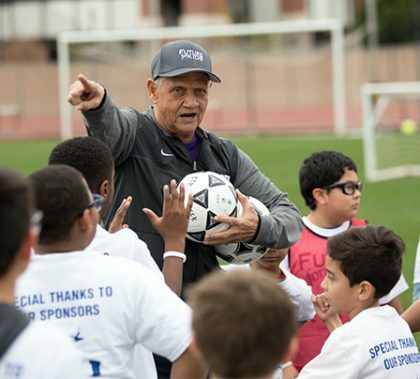 More than 160 youth, ages 7 to 12, attended the event, which marked the first time GCU men’s soccer has hosted a camp with Future for KIDS, a mentorship program that emphasizes education, ethics and athletics.